From the perspective of an electronics designer, but also taking into account price/cost and social considerations (see Coltan mining and ethics link below), I tend to avoid Tantalum capacitors under many circumstances, while favouring Multi-Layer Ceramic Capacitors (MLCCs). My question, bluntly stated is: In which specific cases should I be careful and continue using tantalum capacitors? All sorts of answers and technical approaches to this matter will be very useful to me (and surely for other designers). Microphonics. How bad are MLCC really are in this respect? Capacitance dependence with voltage and temperature. I address specifically Surface Mount Technology (SMT), assuming more than 90% of all tantalum electrolytic capacitors are manufactured in SMD style. I am focusing here on high-volume consumer electronics products, discarding specifically high power electronics applications, where other considerations may apply. I am not ruling out power conversion/management circuits, where the above considerations are key for capacitors. There are lots of application notes on this. 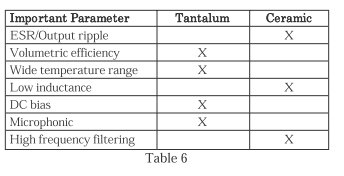 Google for "Tantalum vs ceramic capacitors". Ceramic capacitors are best for its ESR & ESL. So that they can handle huge ripple currents at less temperature rise in power supplies. Same way, they don't disturb signal quality in High-speed systems (AC coupling capacitors). But their DC Bias characteristics are poor. Like a 47uF X5R 6.3V is ~23uF @ 3.3V. This Low ESR & ESL may be bad in some cases. For instance, some Buck converters that require enough ripple at the output to be stable. And lower ESL will react with cable capacitances to give unnecessary oscillations. Tantalum capacitors are best known for Volumetric efficiency and Cheap cost, but they are prone to failure due to surge currents. There are alternatives like POSCAPs (polymer capacitors). I might add: Tants do not like applications where high turn-on surge currents are possible…output of a regulator yes (current is limited)…input to a regulator no (current is probably not limited). This can be partly mitigated by derating the voltage by as much as possible, using a 35v tant in a 10 volt application for example. My decision to use ceramic or tantalum capacitors in most cases is based on cost. When i need capacitances bigger than 10uF, ceramic capacitors are expensive and tantalum capacitors are a good option. The only place where I've seen them [personally] in a mass-market product this century was in the VCO [for the wireless] of a Uniden cordless phone. Since you made me curious about this, I've done a bit of googling (for tantalum and VCO) and found MAX2572EVKIT which doesn't terribly ancient (2004), and has some tantalum caps in its BOM. This is a GSM VCO. Also found a teardown of a [rather looking ancient] GSM phone, and they found tantalum caps in it, but the don't say in what subsystem. Also found some in the datasheet of HMC836LP6CE; this isn't clearly dated, but the revision number looks like 2011 or 2012. This is a 4G PLL/VCO so it can't be incredibly ancient. Another teardown found some on the PCB of the iPhone 6; these ones made by Rohm, their role in the phone not stated there, but claimed to be "the most expensive capacitor in the iPhone 6". It's not totally clear to me what you mean by "discarding specifically power electronics applications", but in case others are interested in this, some were also found in a teardown of an iPhone charger. Not the answer you're looking for? Browse other questions tagged capacitor component-selection ceramic passive-components tantalum or ask your own question. Are tantalum capacitors safe for use in new designs? Why does the LM1117 data sheet specifically specify tantalum capacitors? Are polymer tantalum capacitors safe for use in new designs? Should I use MLCC or Tantalum capacitors near the board's power input? How fast do tantalum capacitors self-heal?